Oh yes. Perhaps the best fusion of cuisines I've ever had. I often wonder why I don't see this dish EVERYWHERE. 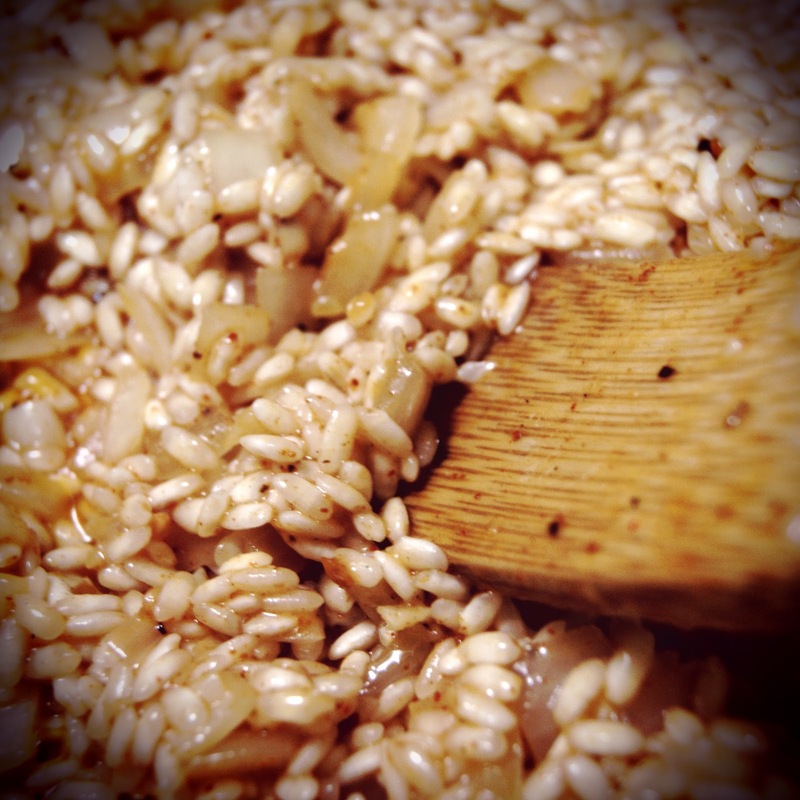 It is the perfect creamy risotto texture with the flavors of your favorite mexican dish. We chose to stick with our favorite chili ingredients for this first trial run, but you could do a simple cheese and shrimp or do a take on huevos rancheros with eggs and tomatillos. 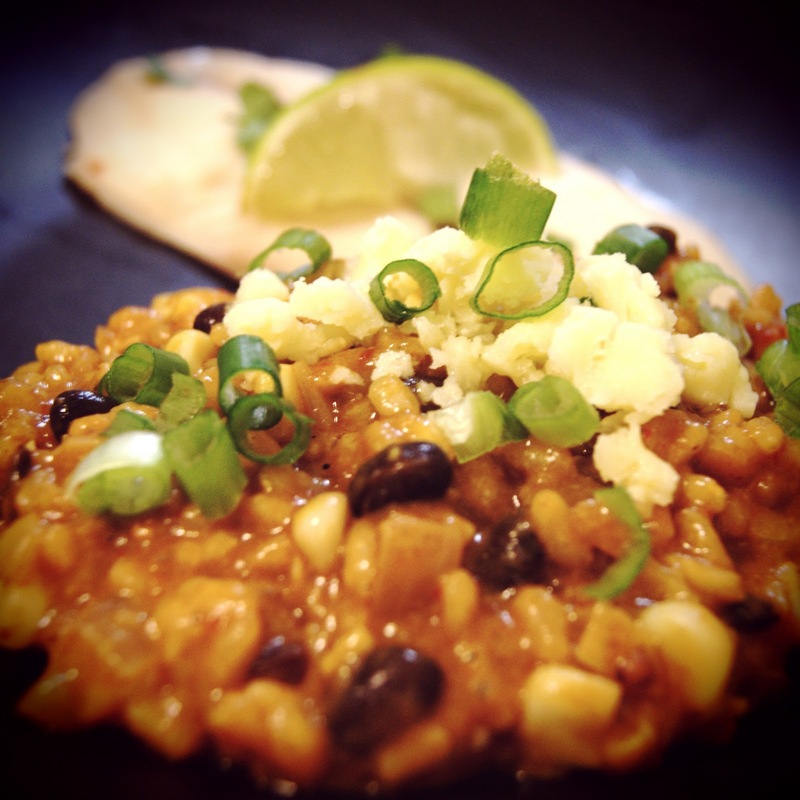 You could deconstruct any of your favorite Mexican dishes and add it into the risotto and I guarantee it will taste amazing. We served this with a tequila lime marinated tilapia, but the risotto overshot the fish so far that the fish would have been better off mixed into the risotto. Put the stock and tomato soup in a saucepan. Bring to a low boil and then reduce the heat to keep it warm. Heat the butter and oil in a pot and saute the onions for 1-2 minutes. Add garlic and mix well. Add the rice and stir with wooden spoon to coat all of the rice with fat. Add taco seasoning and stir in. Saute the rice in the butter and seasoning for a few minutes and then add the tequila, ale or wine. Stir until it is completely absorbed. Add 1 ladle of liquid and stir until absorbed. Continue to add the liquid in this manor until the liquied has been absorbed and the rice is al dente (~18-20 minutes). Reserve the last ladle of stock. Add the beans, chile, corn, cilantro, most of the cheese (save some for garnish) and the last ladle of stock. Stir until all incorporated and cheese has melted. Salt, Pepper and add hot sauce an/or cayenne to taste. Remove from heat, serve with scallion garnish.